The battles that changed the future of Europe, with a clever area-based movement system and large, gorgeous pieces. • Trautenau 27 June 1866: Ludwig von Gablenz's Austrian X Corps defeated Eduard von Bonin’s Prussian I Corps using outflanking tactics. • Soor 28 June 1866: The same methods failed when X Corps faced the Prussian Guard. • Nachod 27 June 1866: Karl von Steinmetz’s Prussian V Corps won a bloody battle against Wilhelm von Ramming's Austrian VI Corps. • Skalitz 28 June 1866: Prussia's V Corps trounced Archduke Leopold’s Austrian VIII Corps. • Jicin 29 June 1866: The Prussian First Army defeated the combined forces of Crown Prince Albert of Saxony and the Austrian I Corps. 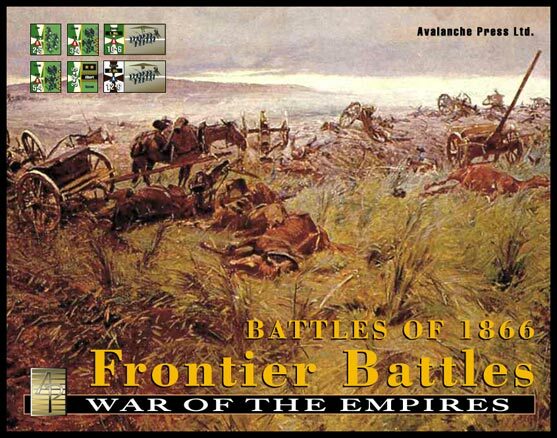 An expansion book for Frontier Battles, based on Bavarian chief of staff Ludwig von der Tann’s plan to deploy the royal Bavarian Army at Jicin to fight the Prussians. 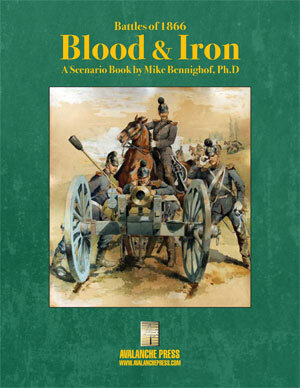 With six new scenarios and 64 additional die-cut playing pieces (24 of them huge doubled-sized ones, 40 of them merely very big), plus the story of the actual Battle of Jicin, the Royal Bavarian Army and its role in the campaigns of 1866. Holding a three-to-one edge in numbers, the Royal Italian Army advanced confidently into Austrian territory in June 1866. But Austria's crack Southern Army struck first, routing the main invasion force at the Battle of Custoza. The culmination of three decades of archival research, Custoza remains a fast and fun game. Austria ha superior morale, leadership and artillery; Italy's recently-expanded army has numbers but not nearly enough high-quality troops. This game has not yet been published. The battle that decided the fate of Europe for the next century, as Prussia defeated Austria in a close-run contest. The largest battle Europe had seen up until that time, Koniggratz is also a very large game. This game has not yet been published.